Your ability to host matches and play multiplayer games on War2.ru (and also whether or not games have lag) is affected by things like your ISP, internet connection speeds, and whether or not you use a router. This article lists the most common hosting & lag issues and how to fix them. War2Combat v4 and newer now supports UPnP (universal plug and play) for automatic port forwarding. If games you host have high latency and you aren’t using the latest version of War2Combat it’s recommended to install it and see if that fixes the problem. 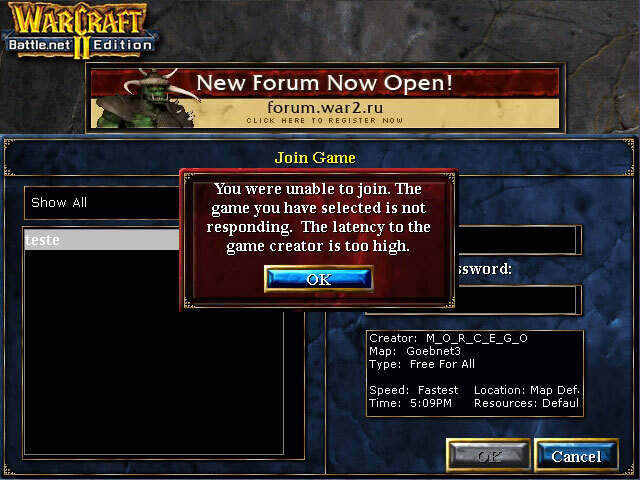 You host a Warcraft II match but your friends are unable to join because they receive a “Latency is too high” message. This happens because your router is blocking traffic for port 6112. There are several solutions for fixing it. Solution #2: Manually forward port 6112 on your router if solution #1 doesn’t fix it. You can test your ports with our port tester tool here (must be logged on to the server). Note: these solutions will only work if your ISP provides a “Real” IP address. (A real IP is NOT the same as a static IP — read more about it here.) If you do not have a real IP then you will not be able to host, period. Your only option is to contact your ISP and ask if they can provide a real IP, or else switch to another ISP. If you DO have a real IP then one of the above solutions will fix the problem. You’re unable to join someone’s game who can usually host without problems, or someone is unable to join your games. Player 1 hosts. Player 2 attempts to join his game and receives the “latency is too high” message. Player 1 leaves his hosted game. Player 2 hosts. Player 1 attempts to join his game. Sometimes (for whatever reason) he will now be able to join Player 2’s game even when he ordinarily can’t. You and one or more people on the same local network want to play together on War2.ru. This is possible by setting War2Combat to use a different game data port on each computer. Solution #1: When you install War2Combat select the random port option. The first computer you install it on should use the “Default Port”, all subsequent computers should use the “Random Port” — make sure you write down what the port number is for each computer. Solution #2: Manually edit the registry to change game data port on the additional computer(s). Check out this guide written by a user on our forum. 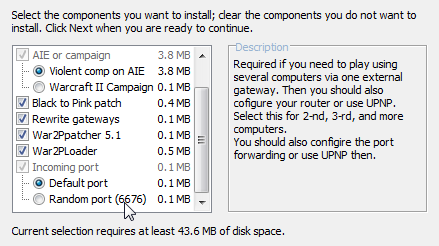 Once each computer has a unique port you need to forward them in your router. The latest version of War2Combat has UPnP for automatic port forwarding on most modern routers. If your router doesn’t support UPnP or you’re still having latency issues on the server then the next step is to follow our port forwarding guide. Sometimes people on the same network won’t be able to join each other’s games even when the ports are forwarded correctly. Check out this article for a workaround.